[fa icon="plus-square"] How are powdered metals produced? “Atomisation involves the disintegration of a thin stream of molten metal through the impingement of high energy jets of a fluid (liquid or gas). Water is the most commonly used liquid in atomisation. [fa icon="plus-square"] What kind of metals can be made using the PM process? An extremely wide array of metals can be made through the PM process. In principle, the technique is applicable to all metals that can be melted and is used commercially for the production of iron; copper; alloy steels; brass; bronze; low-melting-point metals such as aluminum, tin, lead, zinc, and cadmium; and, in selected instances, tungsten, titanium, rhenium, and other high-melting-point materials. [fa icon="plus-square"] How strong is a PM part vs. a wrought part? With proper engineering and material selection, PM material properties can match up well with your needs. Please see our materials selector to understand the strength, elongation and other engineering data that will help you choose the right material for your application. [fa icon="plus-square"] How do you design for PM? While the design of PM is very flexible, it does require that the compact has no undercuts and is able to be ejected from a die cavity. We suggest reviewing our industry website https://www.pickpm.com/design-resource-center/design-considerations/ to help you tailor your component design to the PM process. Or feel free to contact our sales team for help with the design process. [fa icon="plus-square"] How much does tooling cost for the PM process? PM tooling can cost as little as a few thousand dollars for a very simple shape to $30,000 for large and complex part with many levels. Typically tooling costs between $5,000 and $15,000 for most parts that are tooled in PM. Reach out and talk to a member of our sales team to help evaluate your component design to determine its feasibility and tooling cost. [fa icon="plus-square"] What is a typical run size that fits the PM process? We tool parts for as little as 500 pieces annually and have some parts that we run millions each year. 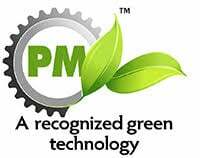 Each of our plants is set up to handle either “short-run PM”, “normal PM” or “high-volume PM”. Talk to our sales team to help determine which of our PM operations is the best fit for you. [fa icon="plus-square"] How is copper infiltration used in the PM process? [fa icon="plus-square"] Can you do secondary machining on a PM part? PM parts are readily and regularly machined with success. If you plan to machine your PM component, it would be beneficial to discuss this with our sales team. Typically we will plan to add manganese sulfide (MnS), plastic impregnation or copper infiltration to the process if machining is required. If you would like more information, please see this attached white paper on machining PM. [fa icon="plus-square"] What kind of tolerances can be maintained in the PM process? PM is known for its ability to hold tight tolerances and to maintain them over the long run. Typically in the direction of pressing on a pressed and sintered compact we can hold +/-0.004” (0.1mm) and +/-0.2% in the die direction. Please call our sales team to discuss more in detail for your application. For additional information, please read this industry white paper on PM tolerances. [fa icon="plus-square"] Why is a lubricant added to powdered metals before molding a part? Typically, between 0.5 and 1.0% (weight) of PM raw material is a wax-based lubricant that aids in the molding and ejection of a preform to reduce tool wear. During the early stages of sintering (the step after molding that fuses the powder particles together), the lubricant is burned away. Here is an article from Metal Powder Review Magazine that discusses recent developments in PM lubricant technology. [fa icon="plus-square"] What size parts can be made by the PM process? The PM process is very versatile and regularly produces components as small as a grain of sand and as large as a basketball. PSM has concentrated the size of parts it produces by operation and has typically making parts as small as a bb and as big as a softball. [fa icon="plus-square"] What are the advantages of the PM process over other metalworking processes? 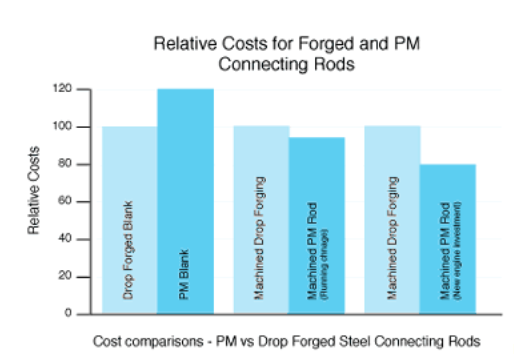 The growth of the P/M industry during the past few decades is largely attributable to the cost savings associated with net (or near-net) shape processing compared to other metalworking methods, such as casting or forging. In some cases, the conversion of a cast or wrought component to powder metal provides a cost savings of 40% or higher. PM typically uses more than 97% of the starting raw material in the finished part and is specially suited to high volume components production requirements. In the automotive sector, which consumes about 80% of structural PM part production, the reason for choosing PM is, in the majority of cases, an economic one. PM process enables products to be made that are capable of absorbing up to 35% of selected fluids. Why then is PM more cost effective? Better material utilisation with close dimensional tolerances. Conventional metal forming or shaping processes, against which PM competes, generally involve significant machining operations from bar stock or from forged or cast blanks. 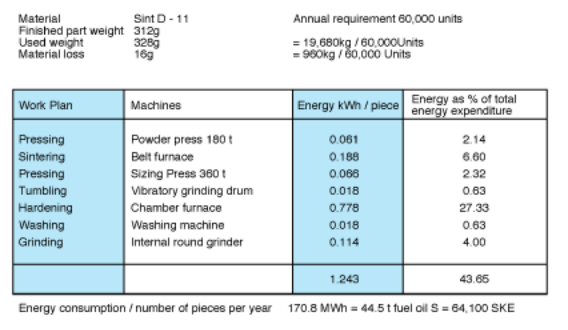 These machining operations can be costly and are wasteful of material and energy.This is illustrated in the figure below which shows that material utilisation in excess of 95% can be achieved with close dimensional tolerances. 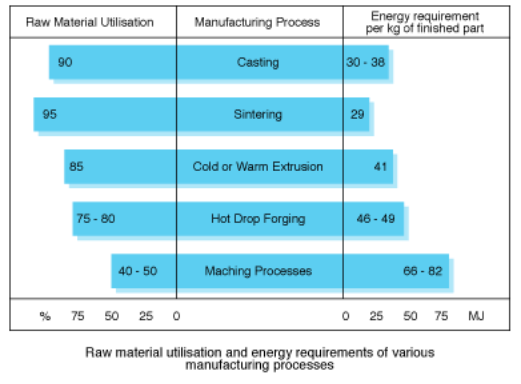 Raw material utilisation and energy requirements of various manufacturing processes. This is a comparison between various manufacturing processes (Casting, Cold or Warm Extrusion, Hot Drop Forging, and Machining Processes) and PM sintering for a production of notch segments for truck transmission. 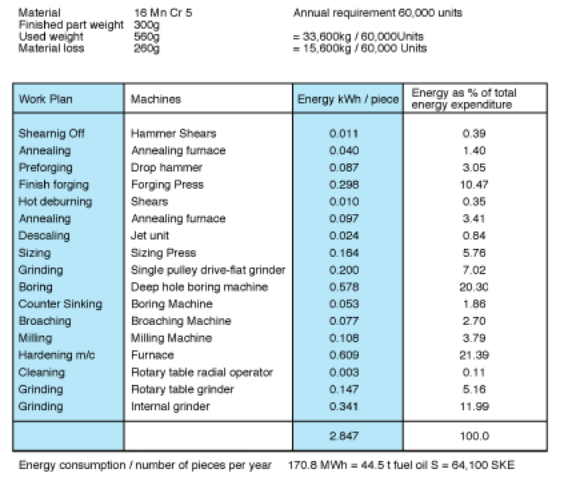 The energy savings alone contribute significantly to the economic advantage offered by PM..
An example is given below for a notch segment used in a truck transmission, where PM consumes only around 43% of the energy compared with forging and machining and the number of process steps has been greatly reduced. .
[fa icon="plus-square"] Is tooling required to make a PM part? To be able to mold a PM compact, tooling is required. Typically a fill of powdered metal of between 2 and 3 times the final part thickness is required. Tooling must withstand molding pressures of between 30 and 50 tons per square inch, so they are usually made from high grade tool steels and tungsten carbides. [fa icon="plus-square"] How long does it take to tool a PM part? Tool design, tool build and first article production lead-times can range from as low as 6 weeks for a very simple PM part to 12 weeks for a complex one. If a PPAP process is required, we would usually add one week to the lead-time. [fa icon="plus-square"] What does the word “sinter” mean? “Sintering is a heat treatment applied to a powder compact in order to impart strength and integrity. The temperature used for sintering is below the melting point of the major constituent of the Powder Metallurgy material. [fa icon="plus-square"] What is the plastic impregnation process for the PM process? Plastic impregnation is a method used to fill the interconnected porosity of a PM compact with a polyester resin to enhance machinability, allow plating and to create a pressure-tight part for a sealing application. [fa icon="plus-square"] Can you plate a PM part? Yes, PM parts respond well to almost all conventional plating techniques once the open porosity of the component has been sealed by plastic impregnation or copper infiltration of the inherent porosity of the process. [fa icon="plus-square"] Can you heat treat a PM part? In short, yes! In most cases, a PM part will use the same procedures used to heat treat wrought materials of the same compositions. Please refer to the attached white paper: "Powder metallurgy materials can be heat treated with great success" if you have additional questions. Why Choose PM over other processes?